Line from the film: "What we think of as dirt is a world teeming with life"
From the ancient city of Tikal, the once-proud center of the Mayan civilization, to modern day New York, people have relied on a balance of nature to maintain the circle of life, and in 2001’s Lost Worlds: Life in the Balance, we see just how crucial, and at times how fragile, this circle can be. 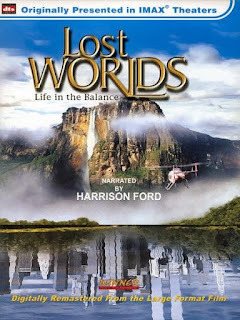 Narrated by Harrison Ford, Lost Worlds: Life in the Balance whisks us off to such exotic locales as the rain forests of South America and the ruins of Tikal in Guatemala, but also visits an apartment building in Manhattan, explaining how even here the natural world is an all-important element of daily life (in a well-choreographed CGI sequence, the camera seemingly enters an open faucet, zooming at top-speed through the pipes, sewers, and underground tunnels until finally reaching a lake in the Catskill mountains, an area that, for years, has provided the city with fresh drinking water). In addition, the film offers some examples of what might happen if this delicate balance is upset. In the 1970s, the Kelp Forests off the California Coast started to disappear. As it turns out, the problem was being caused by the near-extinction of the Sea Otter! Without the otter around, sea urchins were left unchecked (urchins are a favorite food of the otter's) and slowly devoured the kelp, upsetting the entire ecosystem. An effort to protect the sea otter was then initiated, and within a decade, the kelp was back, and as plentiful as ever. Along with its study of the natural order of things, Lost Worlds: Life in the Balance spends some time with researchers as they explore one of the planet’s most mysterious places: the top of Mount Roraima in Venezuela, an area that inspired Sir Arthur Conan Doyle to pen his classic tale The Lost World. And while they didn’t expect to find any dinosaurs, what they do uncover is every bit as amazing. This film definitely teaches us a few things about the world we live in (thousands of years ago, one-third of the planet’s land masses were covered by forests. Over time, as cities were built and continued to expand, these forests disappeared. Even more disturbing than this is the fact that more wooded areas vanished in the last 50 years than all other eras of history combined). 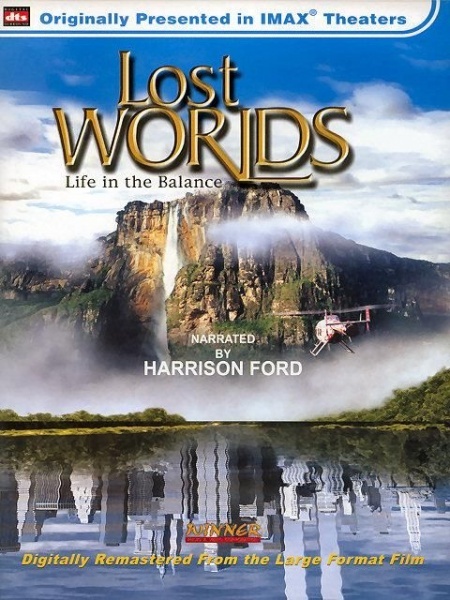 But at the same time, Lost World: Life in the Balance is also an audiovisual marvel, mixing breathtaking shots (such as a helicopter flying over Mount Roraima) with a soundtrack that perfectly complements whatever area of the world the movie happens to be visiting (when the action shifts to Venezuela, we’re treated to some exquisite Spanish guitar music). Taking full advantage of the IMAX format, Lost Worlds: Life in the Balance is an informative documentary that will blow you away with its beauty.